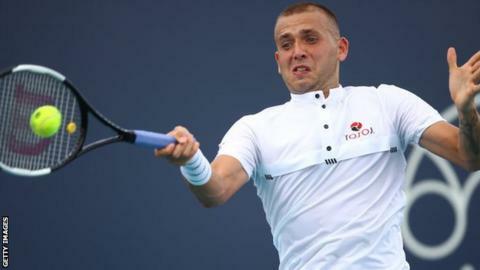 Great Britain's Dan Evans reached the first round of the Miami Open as a 'lucky loser' following a straight-set defeat in qualifying. Evans, 28, clashed with the umpire on his way to a 6-4 6-4 loss to Kazakhstan's Alexander Bublik. But as one of the highest-ranked losers in the final qualifying round Evans entered a 'lucky loser' draw and faces Tunisian Malek Jaziri in round one. Britain's Jay Clarke lost to India's Prajnesh Gunneswaran in his qualifier. British hopeful Cameron Norrie will play Australia's Jordan Thompson in round one, while Kyle Edmund will play Italian Thomas Fabbiano or Ilya Ivashka of Belarus in round two after receiving a bye through the first round. Britain's Johanna Konta faces American Jessica Pegula in round one of the women's draw.